News Archives - Berlin Land Trust, Inc.
BLT's latest news is presented on our Home page, but in case you are interested in past events, please search our archives here. June 2017: Congratulations to Kiara Landeo, Berlin High School 2017 graduate and recipient of the Berlin Land Trust's Cancellarini Service Award. Read about the BLT-Cancellarini Award. June 2016: Congratulations to Madison Blake, Berlin High School 2016 graduate and recipient of the Berlin Land Trust's Cancellarini Service Award. Read about the BLT-Cancellarini Award. Several land trusts will once again host numerous events to raise awareness of conservation and recreational opportunities in the NW corner of Connecticut. Click here for a list of upcoming events are listed on their website. June 3, 2015: Congratulations to Tiffany Nguyen, Berlin High School 2015 graduate and recipient of the Berlin Land Trust's Cancellarini Service Award. Read about the BLT-Cancellarini Award. By Charles Kreutzkamp The Berlin CitizenBerlin has officially closed on a deal to purchase 71.1 acres of property on the Chamberlain Highway that will join existing open space from the Hatchery Brook Conservation area to Bicentennial Park. Click here for full article. March 19, 2015: In case you missed it... Read this summary of Felicia Ortner's Feb. 26th talk "Return of black bears in Connecticut"
57 residents enjoyed the show. Find more photos on our Facebook page. By BILL LEUKHARDT, wleukhardt@courant.comThe Hartford Courant 7:26 p.m. EDT, July 16, 2014Excerpt: " Before the unanimous council approval Tuesday night, land trust president Dennis Kern said the former orchard land — the Chotkowski parcel — will allow the connection of trails that now end at the borders of Hatchery Brook and Bicentennial Park properties." 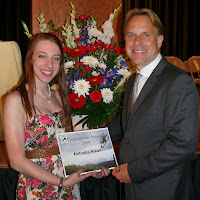 June 10, 2014: Congratulations to Natasha Nixon, Berlin High School 2014 graduate and recipient of the Berlin Land Trust's Cancellarini Award. Read about the BLT-Cancellarini Award. Photo: Berlin High School Senior Natasha Nixon receives the Cancellarini Award from Berlin Land Trust Director Carl Vernlund at the Berlin High School Scholarship Ceremony. Photo Credit: Shannon Manchesi.